Description: The Bat or Bucket Orchids of Coryanthes are distinguished by backswept sepals and a complex lip resembling a helmet mounted above a bucket. Flower: Yellow with reddish-brown spots or cream-colored, the intricate flowers last only 3-4 days, changing rapidly as they mature and wilt. Lateral sepals initially flare outward, later folding back like a bat’s wings in flight, frozen during the upstroke. A small dorsal sepal bends down, while tiny petals are nearly undetectable. 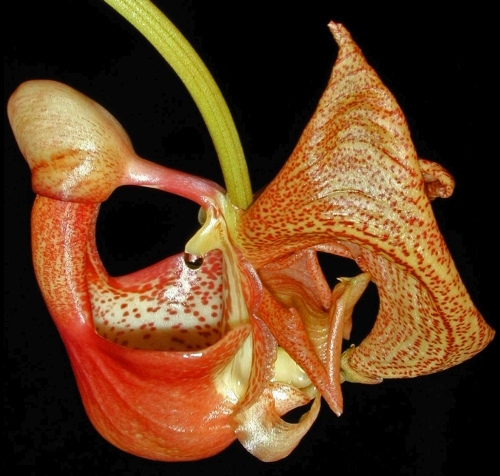 The bizarre lip combines a polished helmet-shaped bulge (Coryanthes is Greek for helmet flower), a smooth central region resembling a water slide, and a deep bucket formed by enlarged, inward-curling side lobes. Paired faucet-shaped glands on the stocky column secrete a clear liquid that drips into the bucket. Plant: Clustered pseudobulbs are grooved or fluted, conical to spindle shaped, each producing 2-3 soft, pleated leaves. A hanging inflorescence emerges from the pseudobulb base. Distribution & Diversity: Approximately 50 epiphytic species favor low-elevation forest from Mexico to Brazil. Coryanthes grows in ant gardens which provide rich soil and herbivore protection, or near wasp nests; they should be approached cautiously. Ecology & History: Darwin described how “humble bees” battle for access to the helmet part of the lip, scrabbling at its surface to collect what we now know are fragrance molecules. The scents are later used to attract females for reproduction. Male bees routinely slip down the slide, suffering an “involuntary bath” in the bucket. The only exit is through a tunnel past a firm hump that wedges the bee against the column, where pollinia are glued to his back. The tunnel and hump are shaped to favor bees of a particular size, reducing the risk of hybridization by smaller or larger bees. Once pollinated, flowers disintegrate into mush thanks to a self-digesting enzyme. Brazil nut trees also are pollinated by bees (Eulaema) that collect perfume from Coryanthes vasquezii flowers growing in intact rainforest. 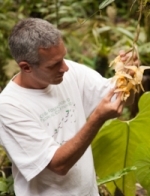 In disturbed habitats, or where Brazil nut trees are grown in plantations, orchid flowers are scarce and males cannot find fragrance to attract females. Without reproduction, bee populations decline and the unpollinated trees fail to produce these delicious and economically important nuts.